Rendering of Church of St. Francis in the Fields’ proposed residential tower and campus addition. Image credit: ABA Studio. Proposal includes school expansion, and the construction of a new residential tower that would include ten affordable units. 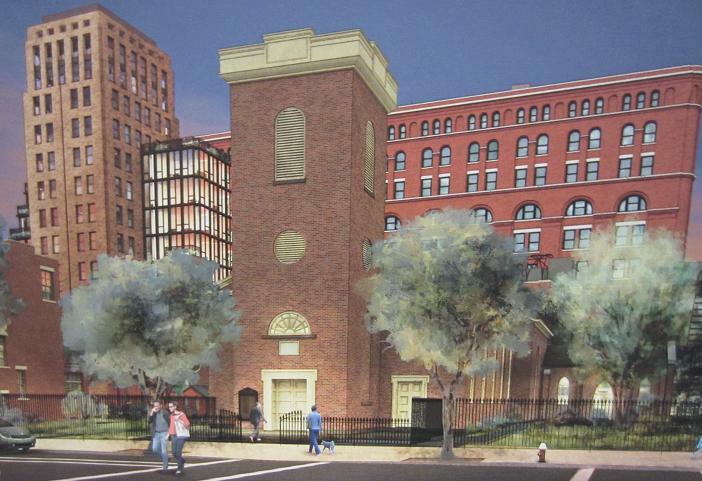 On February 4, 2014, the Landmarks Preservation Commission considered an application for the construction of a new 15-story residential tower and additions to the Church of St. Luke in the Fields campus. The campus occupies a block bounded by Barrow, Christopher, Greenwich and Hudson Streets on the western edge of the Greenwich Village Historic District. St. Luke’s Rector Caroline Stacey explained that the addition of a tower would be built on the site of an existing parking lot and that there would be no demolition of existing structures or reduction in green space on the block. Ten out of forty units, comprising twenty percent of the new tower would be dedicated to affordable housing, ten out of forty units. Stacey said that the planned work was part of “a long-term generational plan” for the church and that the school intended to seek approval for a new community space at a future date. Architect Barry Rice presented the plan for the residential tower, located at the corner of Greenwich and Barrow Streets. The building would be organized as a central masonry “campanile,” intended to recall the historic bell tower, flanked by glass and bronze structures, on a brick-faced four-story base. Setbacks and terraces on the building would be landscaped, bringing the gardens of St. Luke’s campus, up an on to the building. Historic rowhouses on the block would be restored as part of the development, and converted to market-rate dwellings. A representative of Assembly Member Deborah Glick read a joint statement from Glick, Council Member Corey Johnson and State Senator Brad Hoylman that expressed respect for St. Luke’s role in the community, but opposed the new tower as “not contextually appropriate” in its materials and size. David Gruber, Chair of Manhattan Community Board 2 also recommended denial, stating that the “building is too large,” and suggested that the church seek other sources of income. One resident said the scale of the tower was “exponentially greater” than any building on the block, and would “permanently ruin” the charm of block. Area resident David Turner presented studies showing the shadows that would be created by the development, blocking light to the public gardens. Representatives of the Greenwich Village Society for Historic Preservation criticized the colored panels on the school addition, as well as the size, scale, and materials of the proposed tower. Village resident Phyllis Jenkins testified in support of the project, stating that the development would enhance the neighborhood, and successfully combined historic and modern architecture, and that the community needed affordable housing. William Robertson stated that the development would sit well in the corner currently occupied by an underutilized parking lot, and that a “great deal of care and consideration” had been put into the application. Paimaan Lodhi of the Real Estate Board of New York testified that the development would contribute to the public’s benefit, as it represented the first application for affordable housing in Greenwich Village in over 30 years. Lodhi also stated the development only utilized half of the allowable 200,000 sq. ft. of development rights. Given the late hour at which testimony concluded, Landmarks Chair Robert B. Tierney closed the hearing without a response to the testimony from the applicants, or hearing comments from commissioners. LPC: 100 Barrow Street; 657 Greenwich Street, Manhattan (15-1091; 15-1090) (Feb. 4, 2014) (Architect: Beyer Blinder Belle, Andrew Bartle Architects, Barry Rice Architects).